Welcome back to the Sunday review of the week that was in television. Major going ons over at Screen Junkies this week. They have officially announced that their streaming service would be no more, and that they were moving their content over to YouTube, allowing more people to see their programming. And with this week’s Movie Fights, they gave us a massive event. Movie Fights Champion Dan Murrell took on #1 contender #Botanicus, Mike Carlson. Mike was known for his oddball choices and comedic timing, playing quite the opposite to the more business like Murrell. Dan was able to retain the title against Carlson in a fun match-up, but the night was just starting. Spencer Gilbert, the winner of the Showstopper, cashed in for his chance to win the title. And, after a controversial speed round, we have a new Movie Fights Champion! Gilbert defeated Murrell on the fifth question of the speed round. Controversy came in during the 4th round when the question, “Name the best movie with only six words in the title” came up and Spencer said Star Wars: Return of the Jedi. Whether “Episode V” should have been included in the title was a point of contention, but was eventually overruled by judge and host Andy Signore. I am sure that we have not heard the last of Dan Murrell as the chase to reclaim the title has begun. Last Sunday, the WWE presented its ridiculously named PPV, Great Balls of Fire. Strangely though, the PPV was one of the best of the year, overcoming the silly name. Brock Lesnar vs. Samoa Joe was a brutal fight, Cesaro and Sheamus defeating the Hardy Boyz in an Iron Man match was a great match up, and Roman Reigns lost to Braun Strowman in an ambulance match and proceeded to try to murder Strowman by tossing him into the ambulance and backing it into a semi. In what felt like a double turn (though seeing RAW the next night, I don’t think it was), Braun was extracted from the ambulance with the jaws of life, but refused any medical attention and staggered away, leaving a trail of blood behind him. Braun was no where to be seen the next night on RAW, selling his injuries, but Roman was there ready to challenge Brock. However, Samoa Joe came out and insisted he was not done with this whole thing yet. Kurt Angle made a #1 contenders match for next week between Roman and Joe (and if you don’t think Braun is showing up there, then you haven’t been watching wrestling). The rest of RAW was pretty insignificant in comparison to this opening segment, which is a shame. However, on WWE Network, they did debut the WWE 24 documentary on Kurt Angle. This was extremely well done, chronicling Kurt’s life, his Olympic victory with a broken freakin’ neck, his arrival in WWE, and his eventual departure. The doc went into Kurt’s substance abuse issues with alcohol and painkillers that stemmed from his multiple broken necks. The show ended with Kurt’s return to the WWE and his induction into the WWE Hall of Fame. There was a very nice moment shown between Angle and Vince McMahon, whom Angle described like a father figure. The WWE video was very powerful and they show themselves to be extremely solid with these kind of documentaries dealing with their talent. However, all was not rosy this week in the WWE Universe as the well-liked program Talking Smack, an interview program the would air on Tuesday nights to discuss about things that happened on Smackdown Live, was cancelled. 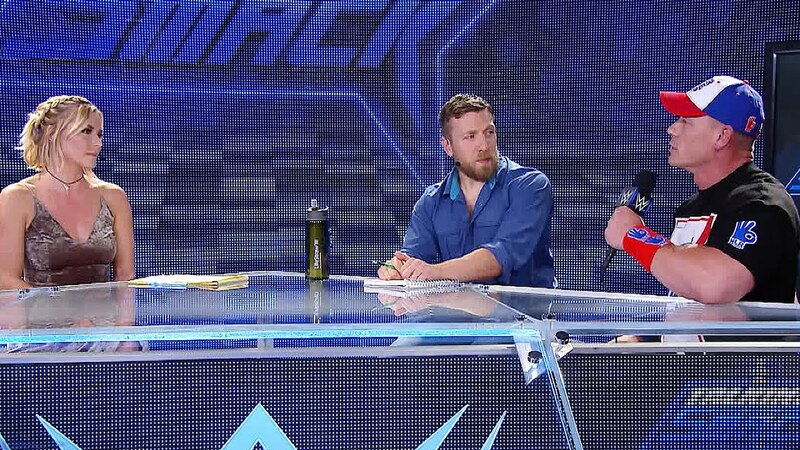 Fans seemed to enjoy the Talking Smack show, hosted by Renee Young and Daniel Bryan, because it was not scripted as closely as the main show, allowing wrestlers to come on and get themselves over with their speaking skills. We would see the performers noticeably more relaxed without the script, which brought about some excellent promos from some who we did not think had it in them. The Miz really started his resurgence when he verbally went after Bryan. Talking Smack will remain after Smackdown PPV’s so hopefully there will be a change in this decision. Or maybe we should have some more animated Camp WWE crap to fill up the hours on the network instead. Twin Peaks last week brought us a great episode a week after the big WTF episode of #8. We started piecing some details together, as a plot might have actually been seen. *Big smiley face*. There were some really solid scenes involving Bobby Briggs and the discovery of a note left for him by his father, Major Briggs. We also had Agent Cole finding the headless body of Briggs. Bob/Evil Cooper also texted a message to Diane, making us all wonder about the wonderful Diane’s actual loyalties. Then we got the long awaited return of the missing Horne child…Johnny. Johnny? With no sign of Audrey yet, Johnny looked to have killed himself by ramming his head into a glass picture frame. As we move into the second half of the season, things seem to be picking up, which means, of course, David Lynch will throw us into some kind of alternate dimension tonight that will seem like it has nothing to do with the story. Ah, Twin Peaks! This week on Preacher, Jesse finally realized that Tulip was not around and was more than just mad at him over their argument. She was in trouble. So he went ballistic with the voice of God to find her. There was a great fight with Jesse and Pat with the tune of Uptown Girl by Billy Joel playing away. This fight scene led to the discovery that Viktor, Tulip’s capture, was also her husband. BOOM. This week’s preacher also did what you never thought it would do … it made you feel bad for Hitler. Seriously, as the other members of Hell were kick the crap out of the Fuhrer, including Eugene by the way, I actually had some feels for him. Yes, I know what Hitler has done, but… I don’t know, it was just really well done. Oh, and the Killer of Saints is on his way. Preacher is delivering big time this year. Oh, yes I know that there is a certain show returning tonight, but I do not watch Game of Thrones, so I won’t be discussing it in future columns. Sorry. The Emmy nominations came out this week and there were several solid picks. EMMY AWARD NOMS can be found here. Stranger Things and SNL received a bunch of nominations, as did Feud: Joan and Bette. I hope Feud wins everything because it was truly some of the best TV of the year. I also hope Alec Baldwin wins for SNL just so we can get the Tweets the next day! SAD! Happy viewing…especially for all of you who are going to be enjoying the return of Game of Thrones. Maybe one day I’ll binge it.